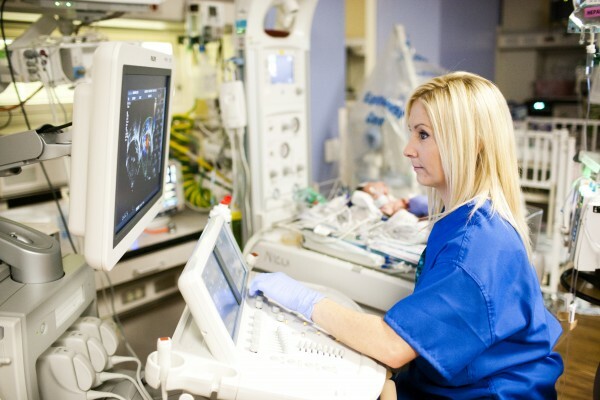 CHOC Children’s radiology department combines individualized care, specialty expertise, and the most advanced technology to obtain the highest quality ultrasounds for your child. Ultrasound is a painless, non-invasive imaging technique that lets us look inside your child’s body without the use of radiation. It uses high-frequency sound waves to create pictures of organs, muscles, soft tissues and blood vessels. An ultrasound is a painless and non-invasive exam that uses harmless sound waves to capture images of organs and other structures inside the body without the use of radiation. During the exam, a hand-held instrument, called a transducer, is used to send out sound waves at a frequency too high to be heard. The sound waves are reflected off the body structures and created into digital images by the ultrasound machine. The images are then used by a specialized physician called a radiologist to diagnose any medical conditions. When is an ultrasound needed? help identify causes of vomiting in young infants. The child and his or her caregiver (must be a parent or legal guardian) are escorted to a dimly lit ultrasound exam room. The ultrasound exam is performed with the child lying down on a soft table. A warm water-based gel is placed on the skin over the area to be studied. The technologist slides the transducer over the area and takes pictures of the underlying organs. The pictures appear on the ultrasound machine screen. During the exam, the child may be asked to hold his or her breath at times or lay in different positions. It is important to hold as still as possible. Most ultrasound exams take 30 minutes. Can an ultrasound harm my child? For standard diagnostic ultrasounds, there are no known harmful effects on humans. We offer a full range of specialized pediatric imaging services, including ultrasound, X-ray, fluoroscopy, MRI, and CT scans.